Ring gear: Either full length pants or thigh length shorts. Usually brightly coloured and some form of Union Jack. If wearing shorts, he'll have coordinating knee pads. Wrist bands and occasionally gloves, again, coordinating with the rest of his attire. 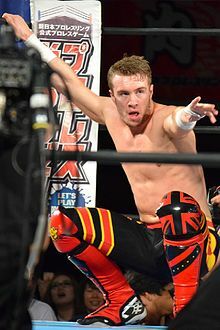 Basically anything Will Ospreay would wear. There sure are a lot of goats round here.